(or is Owl his Paramour...given the sentiment..."Owl always love you"? heeheehee!) Well, I guess that'll remain their little secret! Regardless, both cute critters are stamped with craft inks: Owl: SU Apricot Appeal & Only Orange. Birdy: Tempting Turquoise & Chocolate chip for his branch swing. Step 1) Print the tree template. You may want to extend the branches depending on how you wanna use your tree. The Stitching: I layered the SU Bali Breeze Designer Series Paper onto certain celery cardstock & pierced along the edges so that it would take the stitching with embroidery thread nicely. The Flowers... are punched with SU's Three for You flower punch, shaped & embellished wiht heart-shaped gems in the center. One of them hides the large brad that the Tree top cover swings on. Step 3) Attach the grass & trim it. Hope your day is Craftilicious! WOW! Mel this is amazing! You are so talented. WOW!!!!!! I am amazed!!!! This is so gorgeous and thank you for the templates as well! How sweet of you! OMG girl you are amazing. You always go way above the call there girl! Amazing idea and tut! OMG. This is so funny cute. I love how the owl is hidden behind. That is just marvelous cute. This card cracked me up with smiles. Too darn creative you are! So very cool!! What a fun fun project! Fabulous again Mel! You are amazing! WOWZERS MEL! This so freaking cool! I love it! Thanks for the template too! You ROCK! Mel, this is amazing! Very creative! Love the little bird and owl! Card idea is just fabulous! Thank you, Mel, for sharing the templates! This is a ridiculously cute card, Mel! You amaze me! You just amaze me Mel!! My goodness, Mel, this is fabulous! Wow!!! Amazingly cute project! And thanks for the great tutorial! Its just too precious for words! I love every little detail! TFS. Oh my gosh!!! Mel this is absolutely amazing, you are so inspirational!!! Mel - this is totally adorable!!! You are so creative - I love it!!! Could you further expand one the "wild grass" you're using? oh holy moly. This is awesome!!! I am going to try out the tree... I did try the grass thingy, i just have not uploaded it yet. you will be seeing it soon! Amazing, love the card and Thank you, Thank you, Thank you for the tutorial! oh my goodness, girl! so CUTE!! Love the 3d card, Mel! Very, very cool! 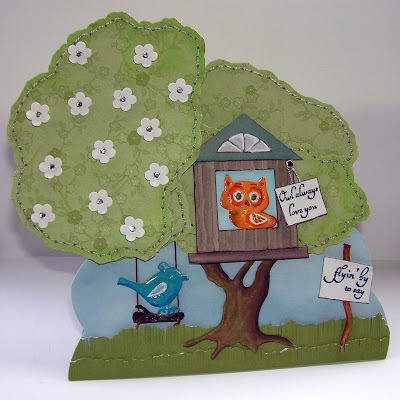 Love that owl in the tree house. . .he looks so comfortable inside it. How are you liking your Copic markers? Looks like you're making fabulous use of them! Thank you for sharing the template. Oh wow....your card is amazing and I LOVE the way you embellished it...so yummy! This is Amazing idea !!! Ok, THIS is the CUTEST thing!!! WOWSER! Very much it was pleasant. Simply super!! !